MINSK (BeITA) — Kazakhstan might acquire a stake in Gomselmash, First Deputy Prime Minister of Belarus said at a session of the Belarus-Kazakhstan intergovernmental commission for trade and economic cooperation on 26 November. 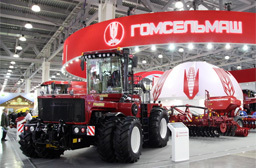 Gomselmash is one of the largest manufacturers of agricultural machinery ranking among the world market leaders of combine harvesters and other complexes of agricultural machines. “This [acquisition] will help expand operations, meet the domestic demand and promote products on the third markets”, Alexander Turchin said. In his words, this matter was discussed during a meeting in reduced format on 26 November. The parties agreed on how to proceed with this matter. “We see a clear way forward”, the first vice premier said. In January-September 2018, Belarus-Kazakhstan trade expanded by 42.6% over the same period last year to make $693.8 mln. “We expect our trade to reach $1 bln by the yearend. This is a good figure, but I should admit that it falls behind our economic potential”, Alexander Turchin said.